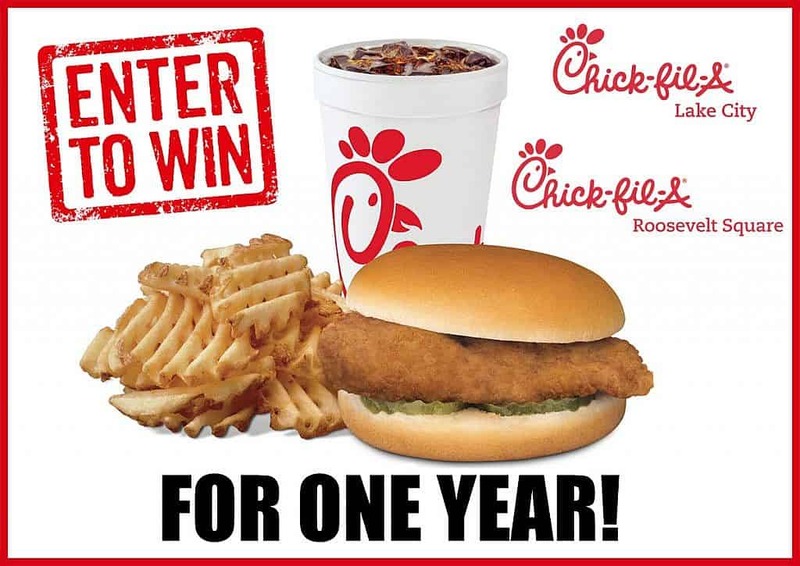 Winners get FREE Chick-fil-A for a year! Roosevelt Square and Chick-fil-A Lake City. Winner will receive 52 digital offer cards pre-loaded with a #1 meal. Prizes have no cash value and may not be sold, offered for sale, assigned, transferred, offered for transfer, photocopied, duplicated, or redeemed or exchanged for cash. One DOC per transaction; you must present and surrender DOC to get the offer; DOC is good only in the U.S.; DOC is void where restricted, prohibited or taxed; DOC is not transferable, including via electronic means; no copies (electronic or print), facsimiles or photographs accepted; DOCs are void if reproduced, copied, altered, transferred, purchased or sold; Internet distribution of DOC is strictly prohibited; DOC may not be combined with any other promotion or offer; no cash refunds are given for DOCs; DOCs may not be accepted at some Chick-fil-A restaurants, including, but not limited to, Chick-fil-A Express or Chick-fil-A licensed locations such as airports, college campuses, office complexes and hospitals; any other use of DOC constitutes fraud; and DOC redemption is subject to review and verification. Winners must claim prizes by 5/15/2017.